The President of Panamá, that is. President Ricardo Martinelli in an exclusive interview with Prensa.com. has admitted to “a lot of mistakes” since he took office, including rushing into things without seeking more advice. La Prensa reported that Martinelli listed one of his mistakes the law which eliminated the requirement for environmental impact studies on all proposed development projects. The law was contained in a bundle of proposals leading to the so called “sausage law” leading yo confrontations in Bocas del Toro that resulted in two deaths and more than 700 people being [injured] inclusing [sic] blindings [sic]. According to Martinelli, even though the law was heavily criticized when it was introduced, when a consensus was reached later, more than 90 percent of the original suggestions were approved. “I made a mistake when I revoked it and did not restored [sic] the previous law, creating a legal limbo. 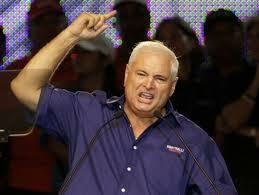 That was a mistake and we have to recognize it,” said Martinelli. “This is a grown up, different country in which we all have to contribute to, and that was a situation that did not happen before. There used to be some individuals who did not pay taxes,” he said. President Martinelli was a very successful businessman when he ran for the presidency and — probably because his opponent was favorable to Venezuelan el Presidente Chávez and had been a good friend of Noriega — he won an overwhelming victory. Despite his mistakes, many of which have offended those on the left, he remains very popular. I could draw some comparisons to el Presidente Obama, but won’t bother; it would be pointless because He is incapable of making mistakes, as we all know. Any president or national leader admitting to mistakes is unusual. Bush refused to do it, Obama doesn’t do it. Only Bill Clinton did it a few times, after being caught with his pants down (literally) and committing perjury. Now he’s the most prominent Democrat in the country. Go figure.